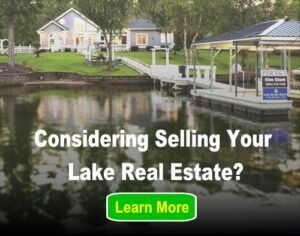 For people who live on, or frequently visit, the lake there are numerous ways to enjoy family fun. Here are a few boating activities that increase family fun on the water. Due to ever-changing technology trends this list is not exhaustive but serves as a starter tool for your own family lake fun search. The bumper boat was originally designed by Edward A. Morgan for use at amusement parks in the early 1970’s. His patent, granted in 1974, states a maximum speed of 4 MPH and requires a shock absorber around the boat for protection. The inflatable bumper boats with built in water guns are fun for the whole family. 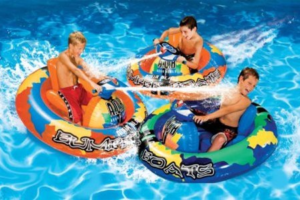 Today, these motorized rafts come in a variety of sizes, styles and shapes. Pricing varies, but some are listed for less than $100. To view the bumper boat that suits your family best click here or here. These boats come with a built-in grill, umbrella, trolling motor and table with 10 place settings! Each spot has three cup holders, a recessed plate and silverware holder alongside six storage compartments for food and supplies. When fully charged, the battery last up to eight hours and the motor maneuvers the water at 2.5 MPH. This boat comes with many features to keep the whole family having fun on the lake. 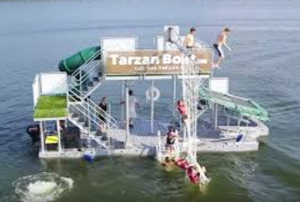 There is also a Tarzan Mini for family fun at a lower cost. The Monkey Jump is a 6-foot platform that provides an area to leap into the water. The Gorilla Jump is a 14-foot-high dive. The Monkey Bounce is a small trampoline. The Gorilla Bounce is a 12-foot-high trampoline that allows you to bounce up to 20 feet above the surface of the water. The Tarzan Swing is a rope swing with a 12-foot swing out range. The Jungle Slide is a 12-foot-high, curving, covered water slide. With all of those choices, families can just throw on some good tunes, bounce, swing and splash their day away. These are just the tip of the iceberg when it comes to new ways to have family fun at the lake. For even more ideas on a variety of ways to be a unique boater check out this cool article!